Let's try to open one of the recent files. The editor pane will come up right next. There you can adjust the primary properties of the image and crop it. The cropping has free or fixed aspect ratio. Next we press Effects button and open Effects Browser. 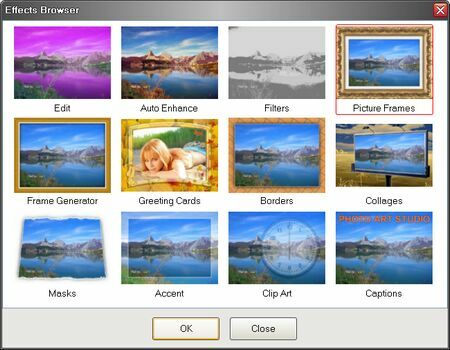 Now we can see all Photo Art Studio capabilities. We select Picture Frames and press OK.
Next we select the first template and press Preview. After the first one we may see another picture frame. Frames are changed automatically after Preview command. 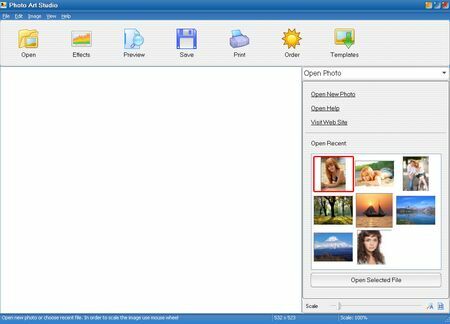 Using mouse we change size and position of the photo inside the frame. If all is OK press Apply. So you can add beautiful frame to your photo for less than a minute!